Here comes Halloween! 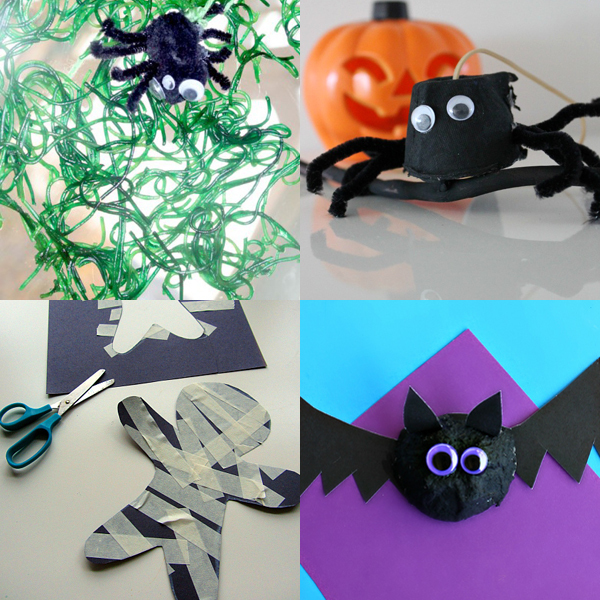 I scoured some of my favorite kid-friendly sites and found this awesome selection of Halloween Crafts for Kids. I think you’ll love them. 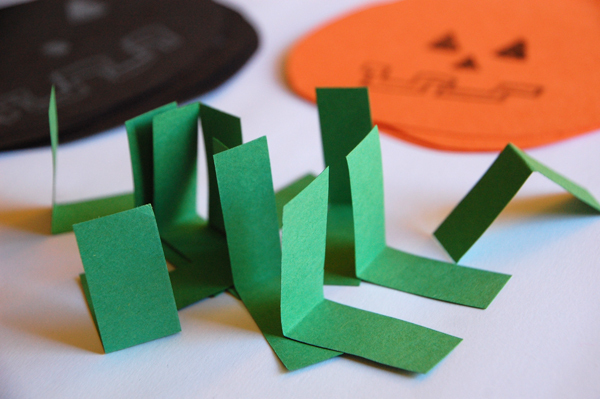 What does this Halloween Crafts for Kids roundup include? Ghosts, pumpkins, spider webs, mummies, monsters, and skeletons. 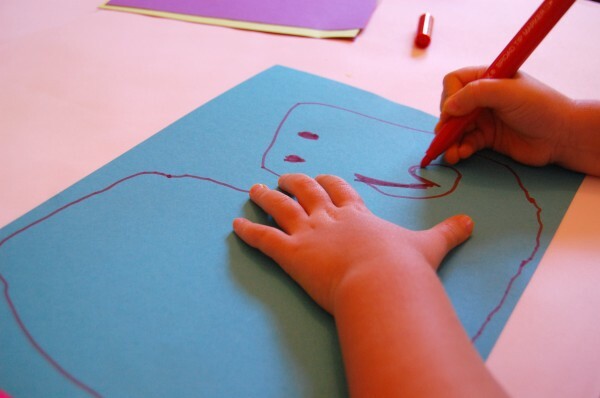 Activities for toddlers, preschoolers, and school age kids. 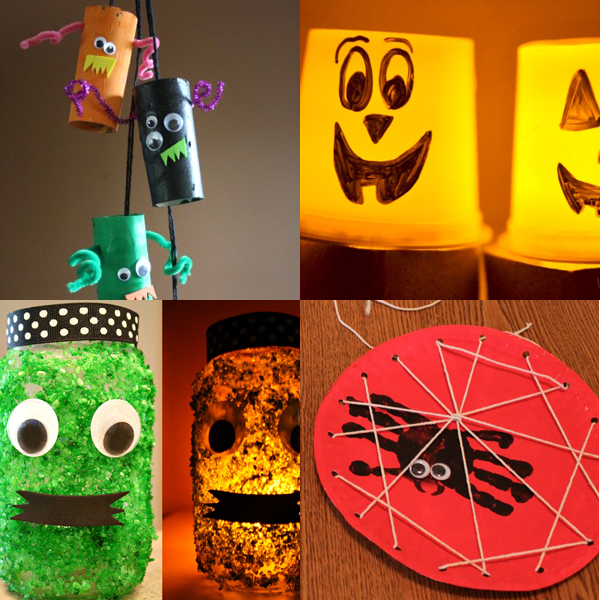 Crafts that kids can actually do. Some with a little adult assistance. 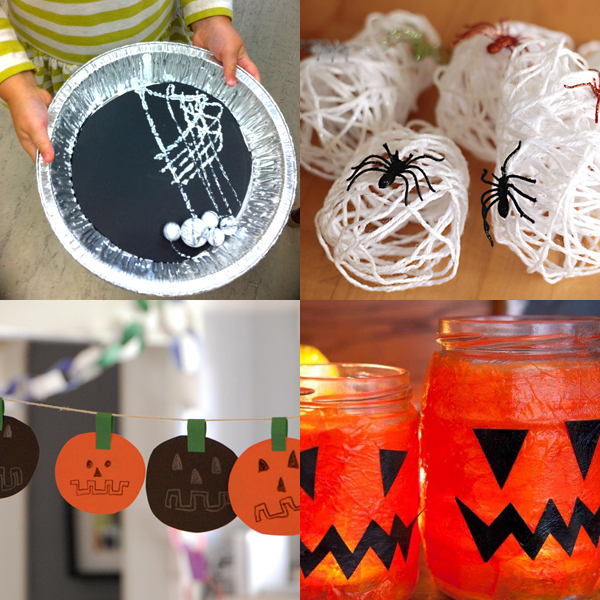 Projects that use easy-to-find household materials such as spaghetti, cardboard rolls, candy, paint, string, jars, egg cartons, gauze, and cotton balls. Sixteen projects to keep us busy for a while! 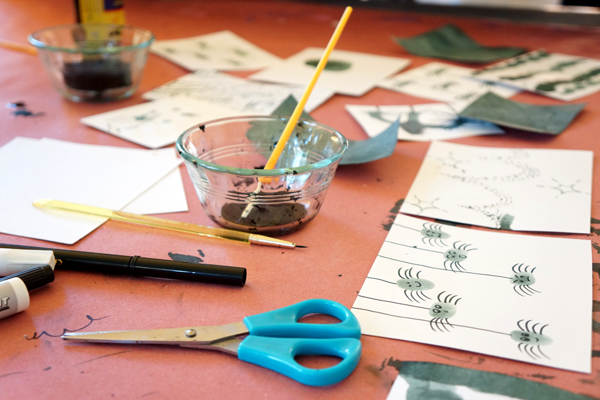 And, you might enjoy signing up for the weekly TinkerLab newsletter. It’s free and we often send exclusive content and opportunities that are only available to our subscribers. 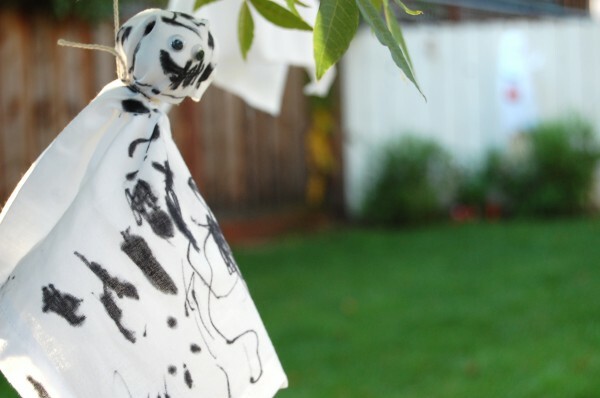 Is it feeling like Halloween or are you looking for some easy Halloween craft ideas? 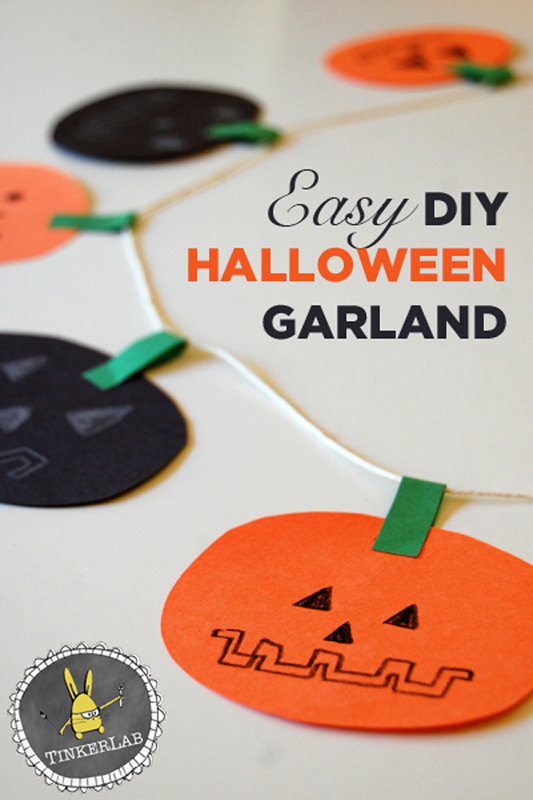 This Halloween garland uses just a few supplies, it’s easy for preschoolers to make, and it adds a festive touch to any spooky room. 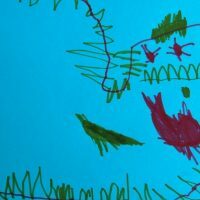 I invited my five-year old to help me come up with a project that other children might enjoy making. 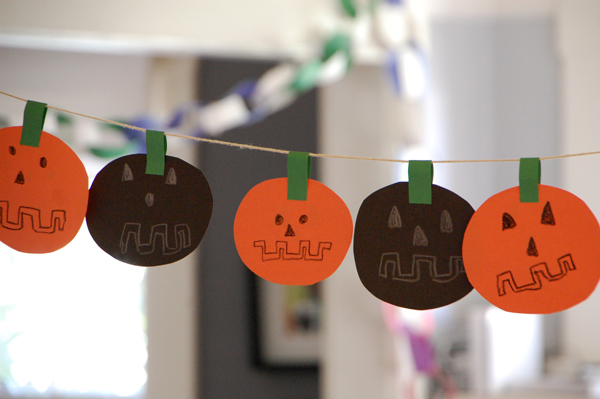 My kids created all sorts of things with the pom-poms, buttons, popsicle sticks, fuzzy pipe cleaners, and paper that came with the kit, and then we finally settled on this simple garland that’s sure to brighten any home for Halloween. 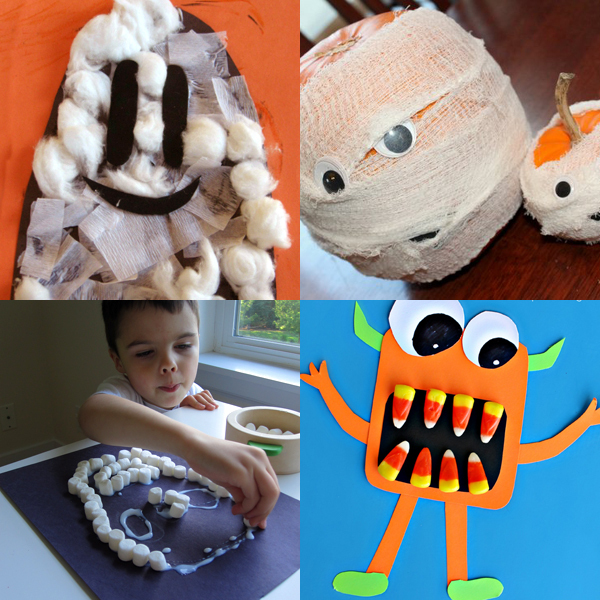 It’s easy to prep, doesn’t require any hard-to-find materials, and your child will be encouraged to think creatively as she invents jack-o-lantern faces. 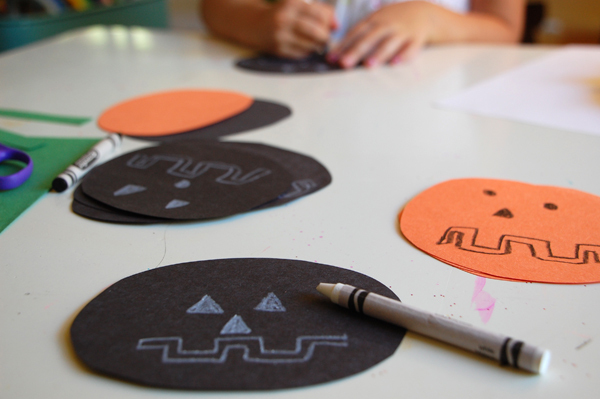 Pre-cut circles from the black and orange paper. Approximately 4″ across. 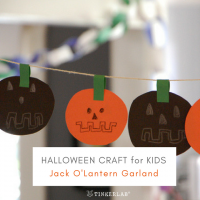 Invite your child to decorate the circular shapes with Jack o’ Lantern faces. 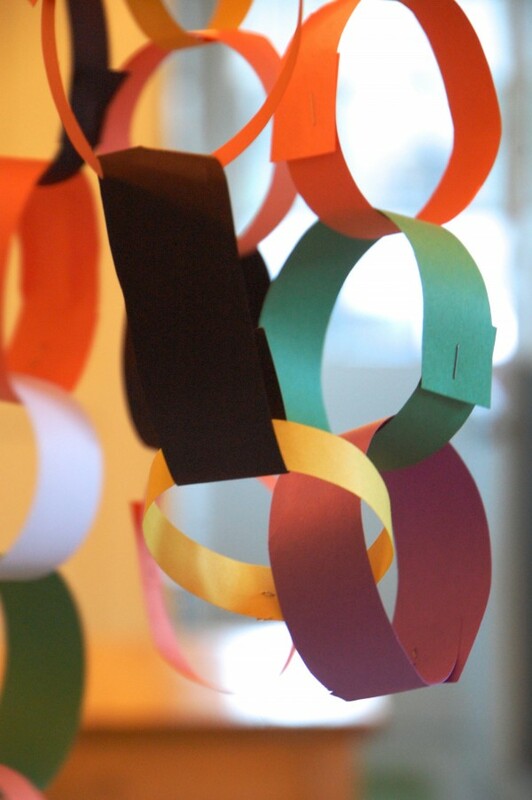 Be sure to color both sides if you plan to hang your garland in the middle of the room. My daughter asked me to join her, and gave me very specific instructions about how the faces should look. I’m a good student and listened carefully. 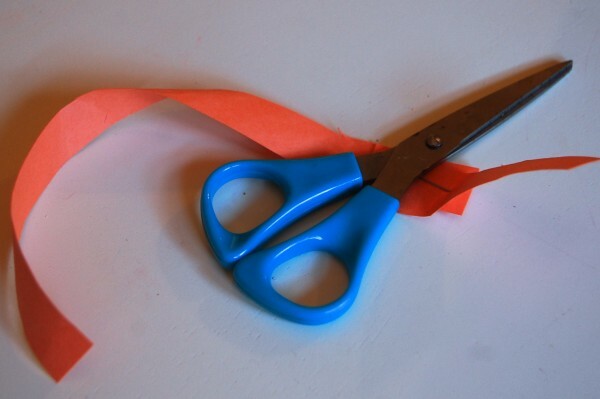 When the faces are done, fold your stems in half and glue them to the piece of string. Be sure to leave about a foot on either end so that you can tie it off to a hook or nail. We decided to tape ours to the rafters because we’re glamorous like that. Creative Invitations like this are a great way to encourage independent thinking and problem solving. 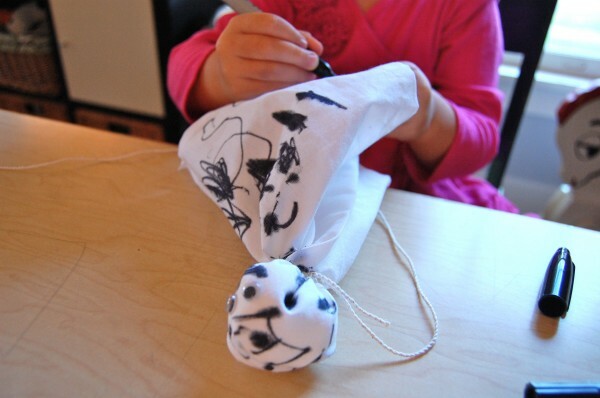 The idea is to set up a provocation with some basic materials, and then step back and see what your child comes up with. 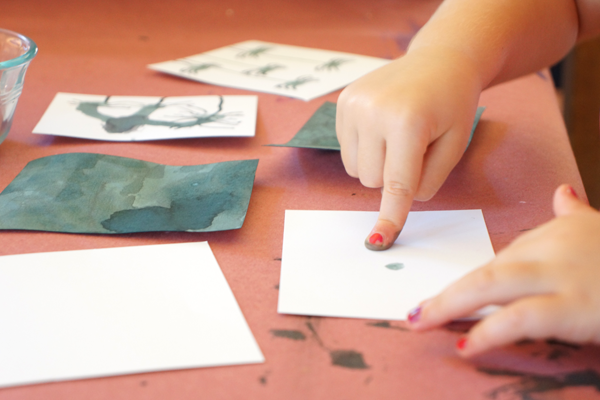 Our friends at The Art Pantry are hosting an Invitations to Create Challenge this month, and you can find out more about it here. 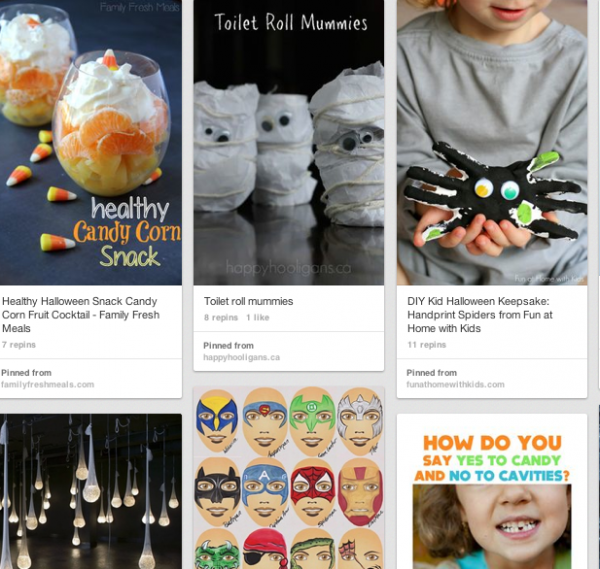 For more Halloween inspiration, follow our Halloween board on Pinterest. 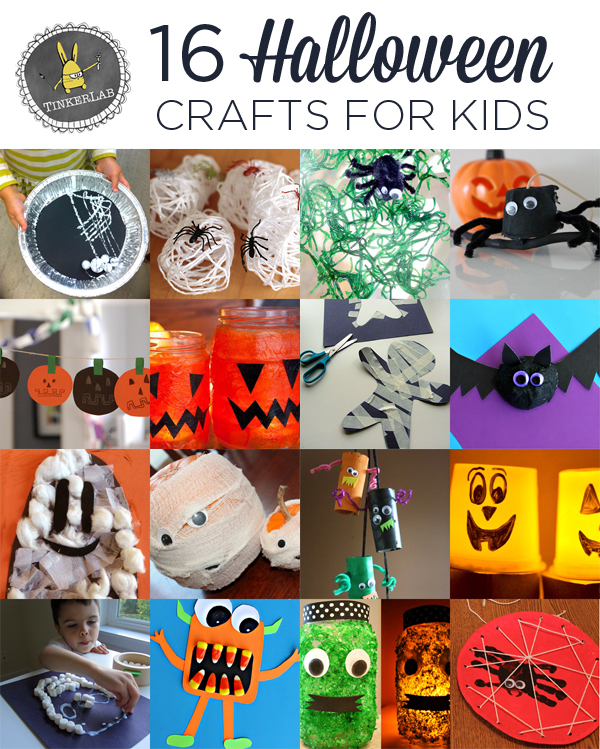 You might also like to see one of our most popular Halloween posts: 50 Simple Halloween Activities for Kids. You can also follow Elmer’s on Pinterest for lots of gluey inspiration. Disclosure: Elmer’s sent us materials to create this project, but all opinions expressed in this post are our own. 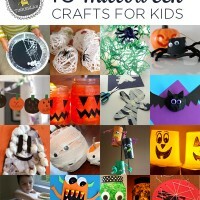 Are you thinking about Halloween and in search of a fun Halloween craft for kids? You’re in luck! 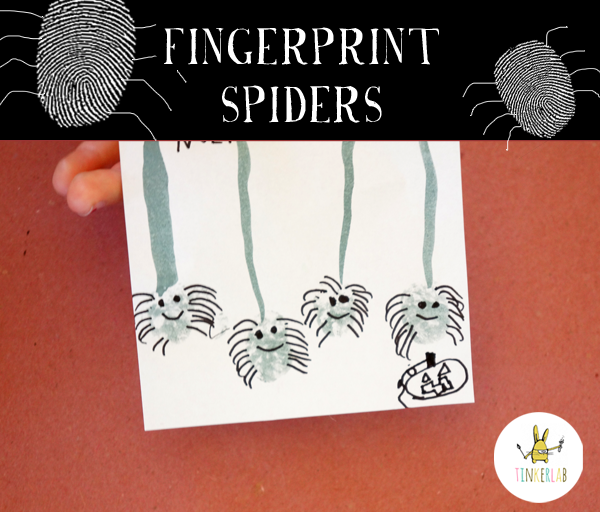 Fingerprint spiders are not only easy to make, but the process offers children all sorts of creative interpretations. 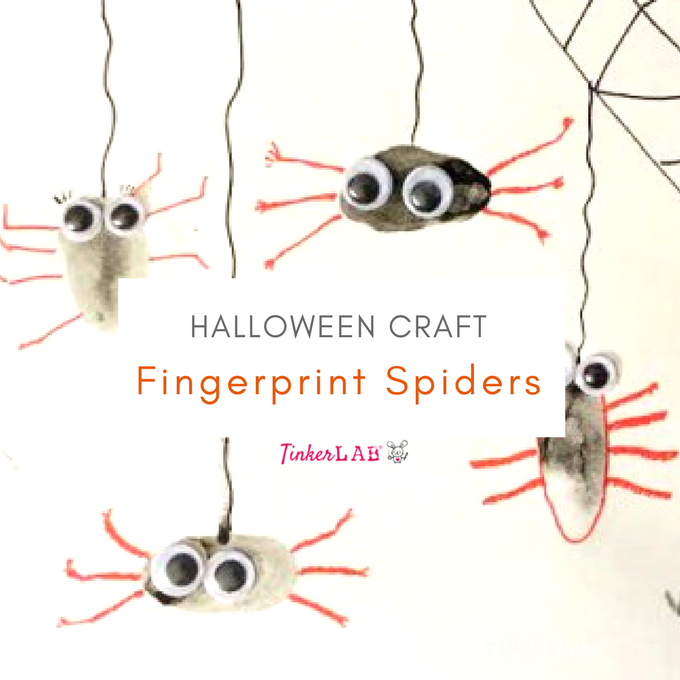 Spider season has arrived, at least in the Halloween sense of the word, and while it may feel to early for some of us, kids can be wildly in tune with the changing of the seasons. Depending on when you read this, if this feels too premature, you can pin this today and keep it up your sleeve for a spooky day down the road. For us, Halloween catalogues have been arriving for a few weeks now, and decorations are popping up in all the local stores. So when my older daughter started drawing jack-o-lanterns I knew that this project would be a hit. 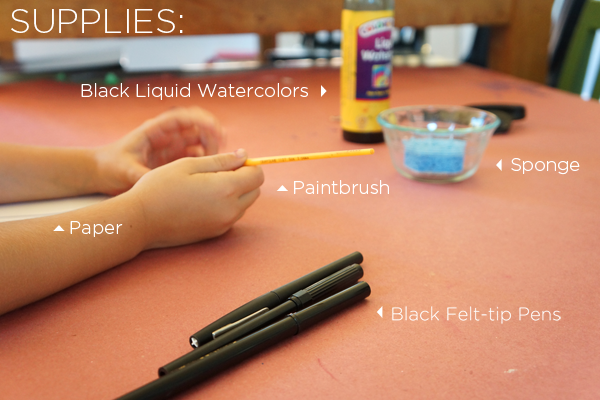 Black Ink Pad or a Sponge and Black Liquid Watercolors (Amazon link). 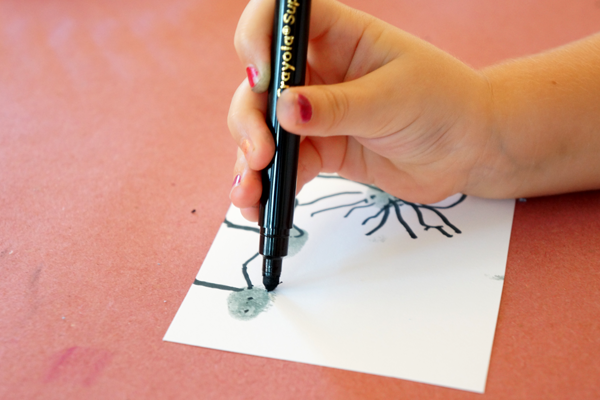 Make some fingerprints on your paper. 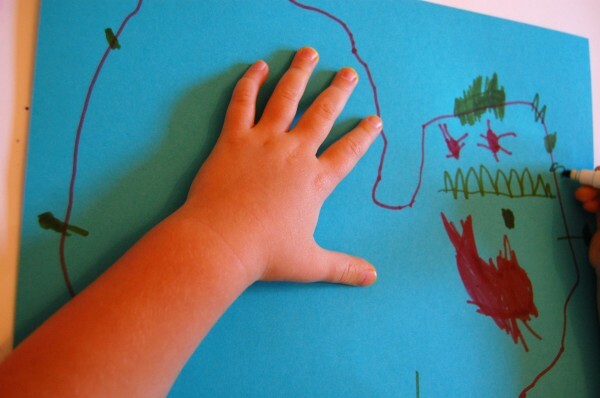 Have a damp rag handy in case your child is sensitive to having ink on his or her fingers. My kids are okay with this, and understood that that the ink won’t wash off completely until bath time. Draw on spider legs and faces. However you like. Add goggly eyes if you have any handy. Spiders have 8 legs. Insects have 6 legs. Cobwebs are simply abandoned spider webs. Spiders do not have antennae. In the 1970’s spiders were sent into space to see if they could build a web with zero gravity. The conclusion? While scientists eventually concluded that the quality of the space webs were slightly different from gravity-based webs, webs were made in space! The biggest spider in the world is the Goliath bird eater, a type of tarantula. Despite our conversation about how spiders have eight legs, my independent-minded five-year old gave all of hers eight legs…on both side of their bodies. She said that they look better that way. What do you think? Now that all the materials are out, experiment a little more and be open to new ideas. We brought out a few more pens to test out the different thicknesses and textures. 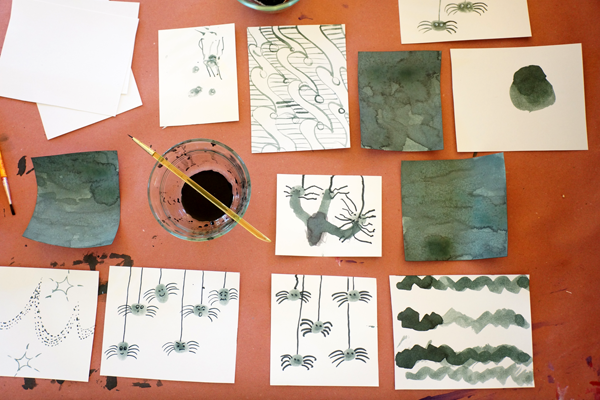 Then we poured some watercolors into a small bowl and made painted spiders. 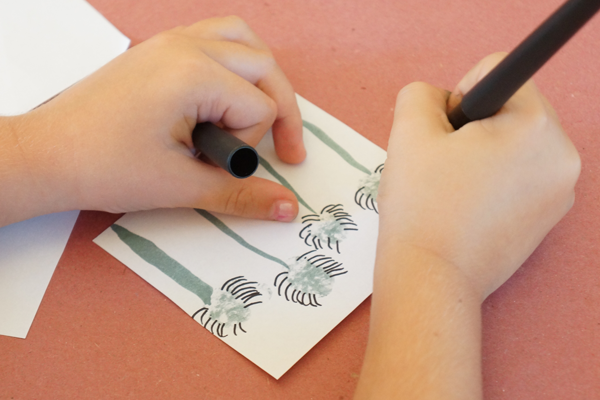 From there, the painting and drawing experiments expanded to include abstract patterns and fully covered pieces of paper. See you next time for more tinkering fun! *For more weird spider facts, Michael Miller, animal keeper at the Smithsonian, compiled a list of 8 strange but true spider facts that will fascinate you. 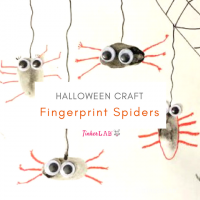 One of my readers and friend, Vlada, sent me these fingerprint spiders made by her daughters. I LOVE the addition of red for the legs. And the goggly eyes! What a fun touch. Are your kids as bonkers about Halloween as mine are? 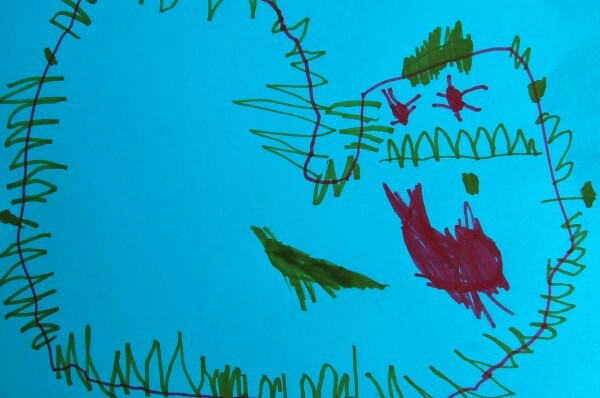 Halloween is one of my favorite holidays, and my passion for it clearly seeped into my kids’ genes because my 4-year old has been filling her sketchbook with pictures of bats and spiders, and wants to know when, when, when we can put up our Halloween decorations. The Halloween catalogues and impossible-to-miss store displays play a huge role in this premature enthusiasm, but I want to celebrate her interests while harnessing a bit of that energy. Oh, and Halloween is still a whopping 41 days away. So I thought we could make a Halloween countdown chain to help us visualize how many days until all that apple-bobbing goodness would be upon us. N selected colors that reminded her of Halloween and we cut them into strips. We wrapped the first piece into a circle, stapled it, and then proceded to interlock the rest of the pieces until we were done. N decided she had enough after around chain link #25. I think the visual cue helped because she hasn’t asked me how many days until Halloween once since we made this. The garland was about fifteen feet long, so we draped it over a chandelier. 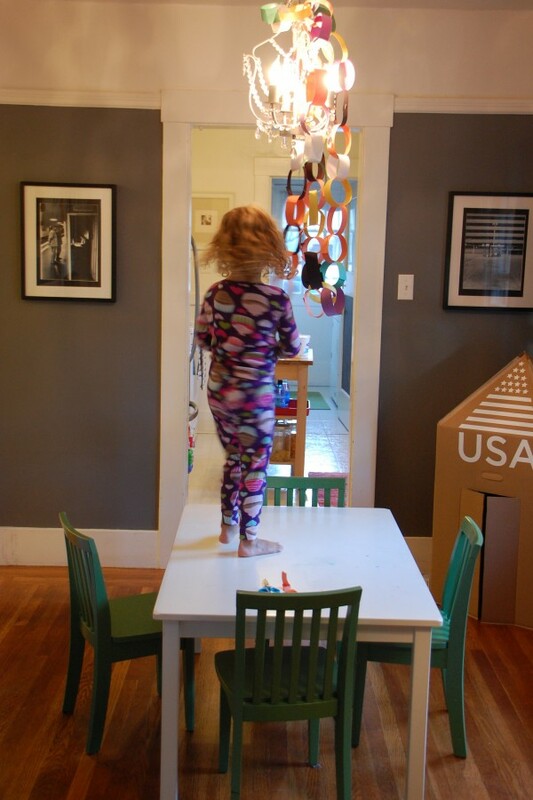 My children jump at any chance to climb on furniture and was eager to cut her first link. Scott, my smarter-than-me husband, came home and suggested I take the chain off the hot light fixtures, and it’s since moved over to the window. I married a good one. Just 41 more to go! Have you given in to early Halloween requests? 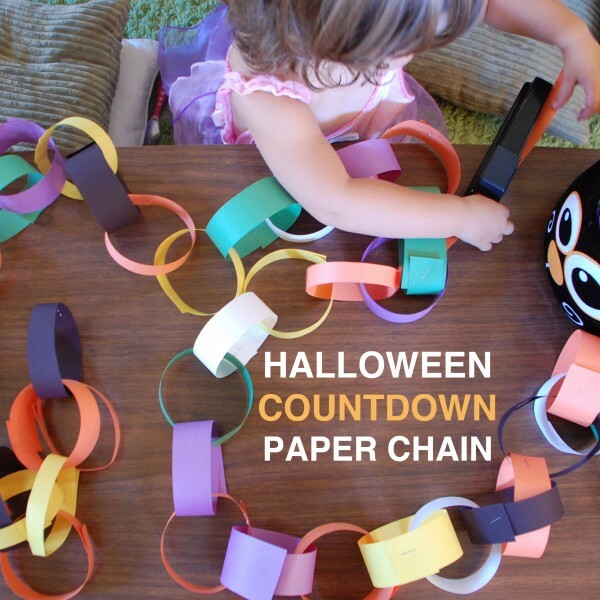 Do you make paper countdown chains for other holidays or events? 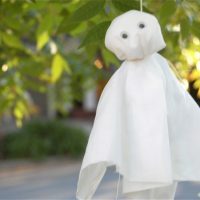 This little fabric ghost tradition began last year, and N has been begging me to revive it for weeks. We haven’t had any white fabric in the house, I didn’t have the energy to make a fabric run, and then low-and-behold I found a quarter yard of fabric in a closet sweep a few days ago! Yay for “free” fabric. 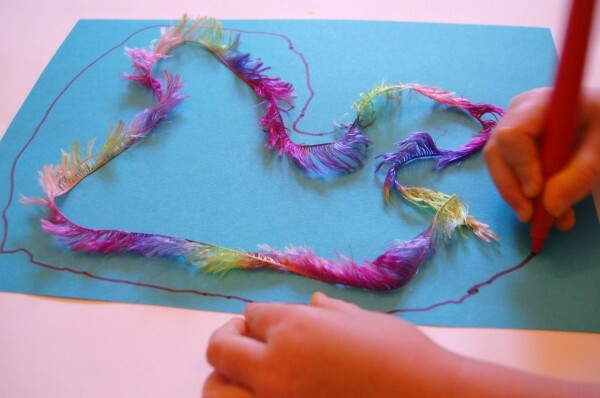 It’s more craft than art, but you’ll see in a minute how this can be open-ended and exploratory for curious, creative little minds. 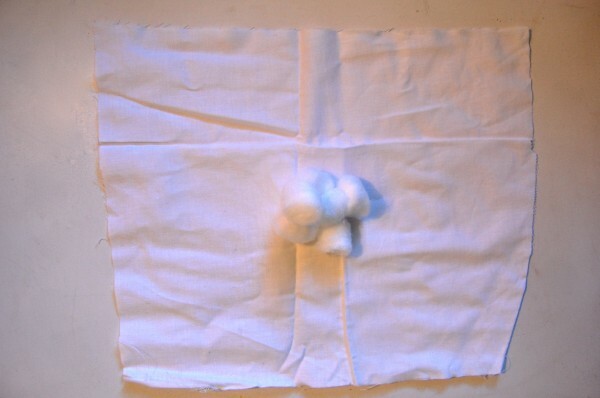 We started with approximately 15″ squares of thin cotton fabric, a little thinner than muslin. But really, almost any thin white fabric will work. We filled the middle with about six cotton balls. Actually, it started out at “five,” but when N took over she increased the number by one or two, until the last ghost had about nine cotton balls in the head. This is good for counting, too! 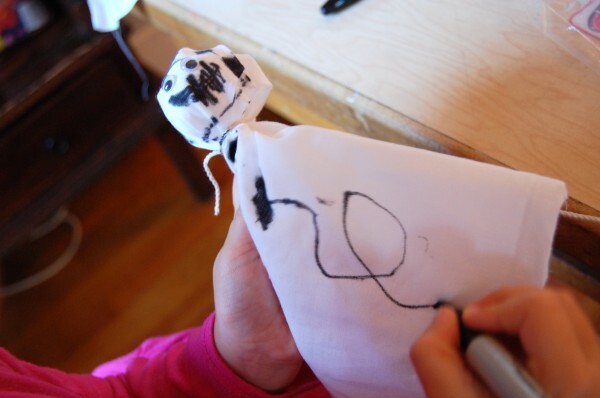 I cut cotton string into lengths of 12″ – 30″ and then tied them around the “heads.” We then glued on googly eyes with white glue. Now for the fun part! N wanted to draw a mouth on one of the ghosts so we found a Sharpie marker. Drawing the mouth turned into drawing hair, ears, and decorating the entire body. So fun! She even drew inside the ghost. There are no limits, are there? 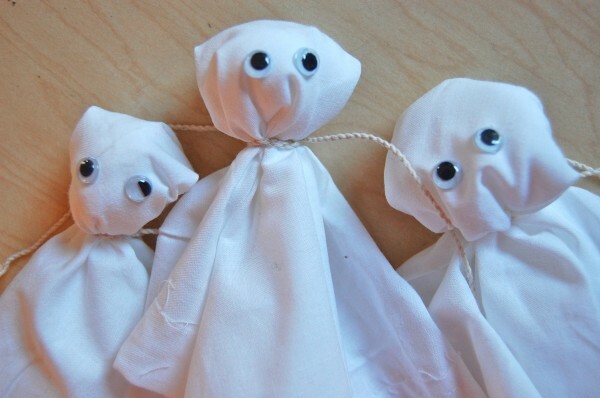 We made four ghosts altogether, and she named this one the “dad.” The others (mom, baby, and sister) were plain white…what does this mean, I wonder? 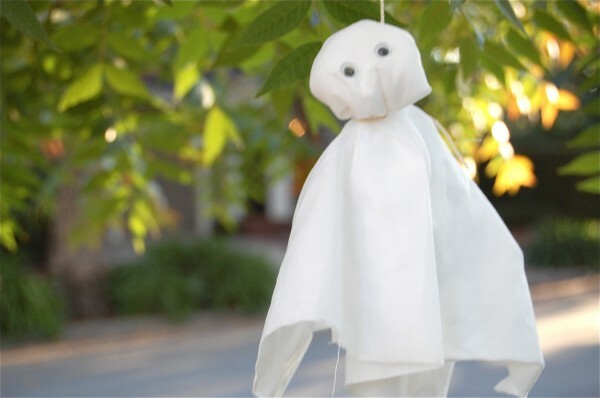 We hung them in the tree to scare our neighbors for Halloween. Monofilament might have eliminated the noose quality of the string, but you work with what you’ve got! Boo! I love hearing from you. Please share your Halloween tradition/s!